Where's this one meant to be? Manchester, heading south from the city centre. It's also partially in existence. Sort of. Well, it's all a little bit confusing, so you'll have to bear with me. Currently, the Princess Parkway is the section of A5103 immediately to the north of M56 junction 3, the main access to Manchester from the south. 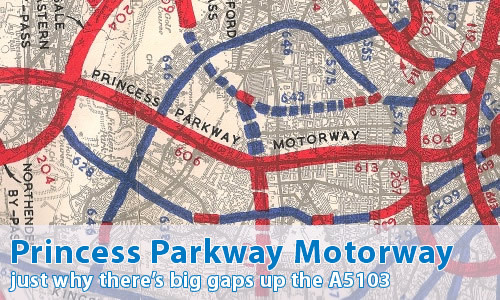 Despite the fact that colloquially the rest of A5103 is known as "The Parkway", it's actually Princess Road. Maybe surprisingly, the Princess Parkway has a long history - going back to the late 1920s. What's that got to do with a motorway then? Just bear with me on this, OK? At that time, Princess Road stopped dead at Barlow Moor Road (A5145). South of there, the now-Manchester suburb of Wythenshawe was founded as a planned community, one of the "garden estates" of the time. Princess Parkway was planned to be a gateway to that community, a wide parkland-setting access road and not a through route. It met Princess Road end on, and ran to Altrincham Road (A560) and was opened in February 1932. Its status as a pleasant access was under threat pretty much from the beginning. In 1936, tentative plans were published by Cheshire County Council and Manchester City Council to extend the Parkway, both northwards to the then-city boundary, and south towards Knutsford. These plans were firmed up somewhat by their inclusion in the 1945 City of Manchester Plan, which, as you can imagine, pleased the residents of Wythenshawe no end. The 1962 SELNEC Highways Plan went further. The Princess Parkway was to be widened to become a motorway, and not only that, would be extended far to the north and south. The section to the south of the Parkway became known, frighteningly enough, as the "Princess Parkway Extension", and met the North Cheshire Motorway near Bowdon. This whole section is now open as the M56, and included the Manchester Airport Spur - part of the original southern section of the Manchester Outer Ring Road. This section opened in 1972. Princess Parkway itself was widened and improved to motorway standards in 1974. Indeed, for the uninformed, it looks pretty much like the M56 immediately to the south. There's a hard shoulder, and either three or four lanes in each direction. Yeah, it is. I reckon that most people don't even notice they've left the motorway proper. Anyway, shall we talk a little bit about the bit north of there? The rest of A5103 Princess Road north of M60 is an everyday dual carriageway, with pedestrian crossings, traffic light junctions, houses and shops alongside. However, take a closer look, and there's one or two slightly odd things about it. Well, let's take the houses and shops first. Along most of its length, Princess Road only has shops and houses down the eastern side of the road. Pretty much all the way along the western side north of A5145 Barlow Moor Road the development is set back quite some way. There are playing fields, and large flat grassed areas, with only post-1990 temporary "tin shed" buildings, a few houses just to the north of the A6010 Wilbraham Road junction and one pub left. Even the old Hulme Crescents were set back a long way from the road, in a manner reminiscent of Fort Ardwick along the A57 to the east of the city - and for the same reason too. Whilst the A57 Hyde Road has plenty of land around it for the M67 Manchester - Sheffield Motorway, Princess Road, more subtly, has the land reserved for the Princess Parkway Motorway. Then as we get further north, we meet the Greenheyes Lane junction. It's absolutely massive, over an enormous area - and Greenheyes Lane is a really quite wide dual carriageway at this point too, before turning to rubbish either side. All of which, especially given that Greenheyes Lane just isn't an important road - heck, it's not even a classified road, is all rather odd. It turns out that Greenheyes Lane is exactly on the line of the never-built Manchester and Salford Inner Ring Road, and the junction there is a temporary affair waiting for the two motorways to cross at a roundabout junction that will, of course, never arrive. North of there, it's even more obvious that something's going on. There's a large gap between the two carriageways that narrows pretty much right in the middle of the section between Greenheyes Lane and the A57(M) Mancunian Way - exactly the layout as if two sliproads were to come off the junctions at either end, and meet the mainline of the motorway somewhere in the middle. There's also these two awfully convenient roads to either side, that would have served local traffic without it having to join the motorway proper. Rather irritatingly, neither of them is now in use as intended - the one on the western side has been converted to a cyclepath, whilst the one on the eastern side is now access to a Land Rover dealership, as well as a cyclepath. It's is alleged that this section opened with motorway-style "NO" signs, listing the restrictions in effect on the road. So where on earth would the motorway have ended? At yet another unbuilt road - the City Centre Road. The end of the Princess Parkway Motorway would have been at a large roundabout roughly where the Whitworth Street/Albion Street junction is today. Yes, it is rather, but that's not the end of the story? Well, the motorway makes it into the 1971 SELNEC Transportation Study, where there's a small twist or two added in. There appears to be two slightly conflicting versions of the motorway in the plan. They both follow the same route, and have the same junction layouts, but there's one thing that's a little different: what happens in the centre of the motorway. In both plans, the central section is two lanes wide, and removed from the rest of the motorway. Heading northwards, it could only be accessed from the point where the present M60 junction sliproads leave Princess Parkway, and from that point until the Inner Ring Road, you're stuck on it. This would have formed a section which, in theory at least, should move more freely than the main motorway for people travelling between the central area and Cheshire. In the first plan, this section would have operated on a tidal flow basis: closed for most of the day, but open for two extra lanes heading into the city during the morning rush hour, and two extra lanes heading out of the city during the evening peak.